The year 2006 turned out to be my lucky year! Not only did I break 3 hours in the London Marathon Elite race, won the first place in the Cambridge Boundary Cross-Country marathon, I also successfully qualified for and competed in the Ironman World championships in Hawaii in October. 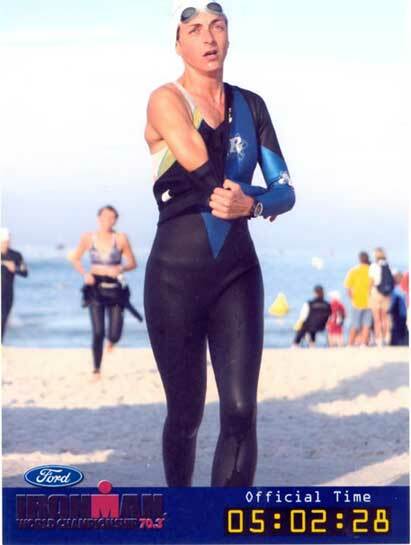 And last but not least, I would take part in the first Ironman 70.3 World championships in Clearwater, Florida! I found accommodation in the beautiful Mariott Hotel on the beach and in only 10 minutes cycling distance from the Ironman village at Pier 60. I had just come back to Cambridge from Hawaii and one week later I was in the plane again to Florida. The many races during the year and especially the Ironman World championships in Hawaii just one month before the event in Florida, had left me physically exhausted. So I decided not to do too much race preparation and training anymore in Clearwater but to try and recover for the competition. I had contacted the official bike shop and race mechanic, Chainwheel Drive, before my travel to Florida, and booked in my bike for assembly and service. I cycled parts of the 90 km cycle course to do some final preparation but I mainly studied the race course on the map. The cycle course in Clearwater was completely flat and it was a one loop course that started at Pier 60. We first had to climb a steep bridge, Memorial Causeway, that connected Pier 60 with the mainland. Then we cycled along Court Street, NE Cleveland Road, Drew Street (and past Chainwheel Drive), then turned to the north into Belcher Road, continued on Countryside Boulevard and then crossed Tampa Road to continue north on McMullen Booth Road to the Trinity Oaks Boulevard. 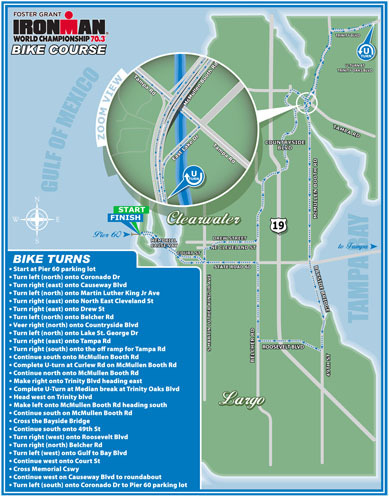 After a U-tunr we cycled back along Trinity Boulevard and then turned into McMullen Booth Road South, crossed Tampa Road and then continued on McMullen Booth Road straight down to Bayside Bridge. Crossing Bayside Bridge was the greatest challenge of the whole race because of the strong wind on the bridge. I had cycled across this bridge several times before in training to overcome my fear from the height of the bridge and the strong wind. After the bridge we had to turn right into Roosevelt Boulevard at 49th Street, continue along Roosevelt Boulevard until we reached Belcher Road. We then turned left into Gulf to Bay Boulevard, continued west onto Court Street, crossed Memorial Causeway to leave mainland and returned to Pier 60. See map for detailed race description! My average pace was above 35km/h because of the flat and easy course. There were a lot of penalties given for drafting. As in the full Ironman distance race, drafting is strictly prohibited in the Ironman 70.3 and aother rule is that it should not take longer tha 15 seconds to overtake another cyclist. It is not allowed to cycle next to each other, to prevent other cyclists from overtaking and to cycle in close distance to another cyclist (drafting). Penalties for breaking rules on the bike are generally 6 minutes stop in the penalty box on the side of the road. Penalties can also lead to disqualification if ignored or if several penalties are given to the same competitor. 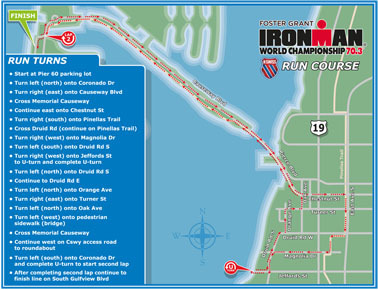 Ironman 70.3 in Clearwater received lots of criticism because of drafting on the cycle course. I had a great race though and managed to adhere to the rules and regulations of the race. The swim course was also a one loop course at Pier 60 (see map). The run course (see map) was a 2 loop course and started at Pier 60. Like in the bike course, we had to first cross Memorial Causeway which connected Pier 60 with the Mainland. The run course was mainly flat apart from the steep incline at Memorial Causeway. Like the bike course, most of the run course was unprotected from sunlight and so it was extremely hot. I improved my personal best time to about 5h15min. Compared to the qualifying Ironman 70.3 races in the UK, Longleat and Wimbleball Lake, the cycle course and run course were easy and the only challenge was the swim course because of the high waves in Pier 60. So for me this race felt like a holiday after the effort that I had to make in the UK to get a qualification slot for the World championships. 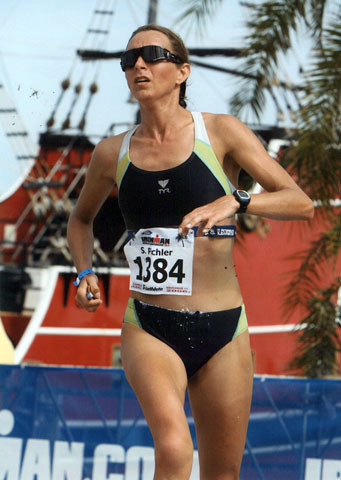 I competed three more times in the IM 70.3 World championships in Clearwater and in my last race in 2009, I finally succeeded to break 5h and improve my personal best time for about 15 minutes. In 2011 the Ironman 70. 3 World championships move to a new course close to Las Vegas strip.